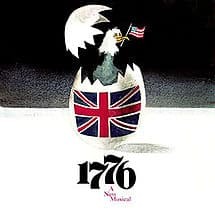 1776 is a musical with music and lyrics by Sherman Edwards and a book by Peter Stone. The story is based on the events surrounding the signing of the Declaration of Independence. It focuses on, and partly fictionalizes, the efforts of John Adams to persuade his colleagues to vote for American independence and to sign the document. It premiered on Broadway in 1969, earning warm reviews, and ran for 1,217 performances. 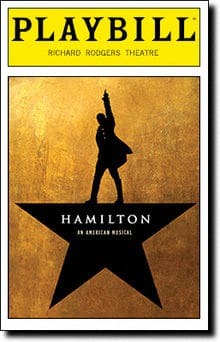 The production was nominated for five Tony Awards and won three, including the Tony Award for Best Musical. The musical was made into a film of the same name in 1972 and was revived on Broadway in 1997. In 1926, Rodgers and Hart had written the only previous musical about the American revolution, called Dearest Enemy. Sherman Edwards, a singer of pop-songs with several top ten hits in the late fifties and early sixties, spent several years developing lyrics and libretto for a musical based on the signing of the Declaration of Independence. Edwards recounted that, “I wanted to show [the founding fathers] at their outermost limits. These men were the cream of their colonies… They disagreed and fought with each other. But they understood commitment, and though they fought, they fought affirmatively.” Producer Stuart Ostrow recommended that librettist Peter Stone collaborate with Edwards on the book of the musical. Stone recalled, “The minute you heard [“Sit Down, John”], you knew what the whole show was…. You knew immediately that John Adams and the others were not going to be treated as gods, or cardboard characters, chopping down cherry trees and flying kites with strings and keys on them. It had this very affectionate familiarity; it wasn’t reverential.” Adams, the outspoken delegate from Massachusetts, was chosen as the central character, and his quest to persuade all thirteen colonies to vote for independence became the central conflict. Stone confined nearly all of the action to Independence Hall and the debate among the delegates, featuring only two female characters, Abigail Adams and Martha Jefferson, in the entire musical. After tryouts in New Haven and Washington, the show opened on Broadway at the 46th Street Theatre on March 16, 1969. Peter Hunt, previously known as a lighting designer, directed. Adams flees the chamber, complaining that Congress has done nothing for the last year but “Piddle, Twiddle, and Resolve.” He reads the latest missive from his loving wife Abigail, who, far away at their home in Braintree, Massachusetts, appears in his imagination. He asks if she and the other women are making saltpeter for the war effort, but she replies that the women have a more urgent problem: no straight pins. They each promise to do something about the other’s problem. In “Till Then,” they pledge their love to each other, and Abigail disappears. The next day, Adams finds delegate Benjamin Franklin outside. Adams bemoans the failure of his arguments for independence. Franklin suggests that, because Adams is “obnoxious and disliked”, a resolution for independence would have more success if proposed by someone else. Richard Henry Lee of Virginia enters, having been summoned by Franklin. The cocky Lee crows that he is the best man to propose the resolution. Adams has reservations, but Lee is convinced he cannot fail: he is a member of the oldest and most glorious family in America: “The Lees of Old Virginia.” He is prepared to ask the Virginia House of Burgesses to authorize him to offer a pro-independence resolution. June 7, 1776. A new delegate from Georgia, Dr. Lyman Hall, enters the congressional chamber and meets the others. Stephen Hopkins of Rhode Island roars into the room shouting for rum, while Colonel Thomas McKean and George Read of Delaware bicker, with the sickly Caesar Rodney stuck in the middle. The charismatic Edward Rutledge of South Carolina informs Hall that the colonies of the Deep South traditionally vote as one. John Dickinson of Pennsylvania, followed by the meek James Wilson, states that he is firmly against what he calls treason. Franklin and Adams enter, and the delegates, along with the President of Congress, John Hancock, and the Secretary, Charles Thomson, take their places. Hancock gavels the 380th meeting of the Congress to order. The most vocal of the delegates debate independence, and the debate grows so heated that Adams and Dickinson get into a physical altercation. Rodney separates them, berating them for not focusing on the real enemy: England. He collapses from the overexertion brought on by symptoms of cancer. Colonel McKean departs with Rodney to take him back home. This leaves the Delaware delegation with only one man present, George Read, who is not in favor of independence. Rutledge, seeing the majority swinging in his favor, calls for an immediate vote on the question of independence. The new New Jersey delegation arrives, led by Rev. John Witherspoon. They have been instructed to vote in favor of independence. The vote now stands at six for independence and six against (with New York abstaining “courteously”), and Adams reminds Hancock (who supports independence) of his duty as president to break all ties. Dickinson then moves that any vote for independence must pass unanimously on the grounds that “no colony [may] be torn from its mother country without its own consent.” The vote produces the same tie, which Hancock breaks by unexpectedly voting for requiring unanimity (prompting an angry outburst from Adams). He reasons that without unanimity, any colony voting against independence would be forced to fight on England’s side, setting brother against brother. Adams, thinking fast, calls for a postponement of the vote on independence, expressing the need for a declaration defining the reasons for independence. Franklin seconds Adams, but when asked why such a declaration should be written, both are lost for words until Thomas Jefferson provides them himself: “to place before mankind the common sense of the subject, in terms so plain and firm as to command their assent.” The vote on postponement is called, producing yet another tie, with New York abstaining “courteously” yet again. Hancock breaks the tie by voting in favor of postponement. He appoints a committee of Adams, Franklin, Sherman, Robert Livingston of New York, and Jefferson to draft the declaration. Hancock adjourns the session over Jefferson’s complaints that he must go home to his wife. The Committee of Five argues about who should write the declaration (“But, Mr. Adams”). Adams declines Franklin’s suggestion that he do so, reminding Franklin that he (Adams) is “obnoxious and disliked.” Adams asks each of the others, in turn, to be the drafter, but each demurs: Franklin argues that he is not a political writer, only a satirist; Sherman claims that he is not a writer at all, but “a simple cobbler from Connecticut”; and Livingston must return to New York to celebrate the birth of his son. All eyes then turn to Jefferson; Adams quotes a passage of Jefferson’s Declaration of the Causes and Necessity of Taking Up Arms, bluntly telling Jefferson that he is the best writer in Congress. Jefferson tries to wriggle out of the responsibility, pleading that he has not seen his wife in six months. Adams, unmoved by Jefferson’s arguments (as he, too, misses his own wife), thrusts a quill pen into Jefferson’s hand and successfully reminds him that his duty must come first. Defeated, Jefferson accepts the duty of drafting the document. On June 22, 1776, Congress has reconvened. By now, Adams is worrying, and begins trying to win over some of the states, sending McKean to try to convince Read. A letter is received from General Washington. He reports that the troops are suffering from venereal disease and drunkenness. He implores the Congress to send the War Committee to New Brunswick, New Jersey to boost morale. Chase challenges Adams: how could an army composed of “drunken militiamen” hope to defeat the British Army? Adams rejoins by asking whether, if Chase were convinced that the Continental Army could defeat the British, Maryland would then vote in favor of independence. Chase eventually agrees, and Adams, Franklin, and Chase leave for New Jersey. The remaining delegates in favor of independence also leave the chamber. Alone with his fellow conservatives for the first time, Dickinson leads them in a minuet, singing of their desire to hold onto their wealth and remain “Cool, Cool Considerate Men.” During their dance, a dispatch comes from Washington warning them of British advances on Philadelphia, however these warnings fall on deaf ears. After the dance, the remaining delegates depart, leaving Andrew McNair (the custodian), the courier, and a workman in the chamber. The workman asks the courier if he has seen any fighting, and the courier replies that his two closest friends were killed on the same day at Lexington. He describes the final thoughts of a dying young man as his mother searches for his body (“Momma, Look Sharp”). Jefferson is outside the chamber as Mr. Thomson, the secretary, reads the declaration to Congress. Adams and Franklin meet him delightedly: an exhibition of shooting by the Continental Army has convinced Samuel Chase, and Maryland will vote in favor of independence. They congratulate Jefferson on the excellence of the document, and Franklin compares the creation of this new country to “The Egg.” This leads the trio to debate which bird is breaking out of its metaphorical shell and would best represent America. Franklin tries to coax them into choosing the turkey, but the three settle on the eagle, as insisted upon by Adams. As Hancock is about to call for a vote on the Declaration, Rutledge rises to object to Jefferson’s denunciation of slavery in his list of redresses. He engages in an intense discussion with Adams and Jefferson, who both demand slavery’s end and insist that the slaves in the South are people being treated as property, and must be freed. Rutledge in turn reminds them that the process of “Molasses to Rum” to slaves (the triangular trade) ensures prosperity for the North. Angered, the delegations of North Carolina, South Carolina, and Georgia leave the chamber. The resolve of the remaining delegates is broken, and most of them also leave. Adams, growing desperate, sends McKean to Delaware to bring back Caesar Rodney. Franklin insists that Adams agree to the removal of the slavery clause from the Declaration. Alone with his thoughts, Adams conjures Abigail in his mind and pours out his fears and feelings of hopelessness to her. She reassures him, quoting from his own letters: “Commitment, Abby, commitment! There are only two creatures of value on the face of this earth: those with a commitment, and those who acquire the commitment of others.” During their exchange, McNair delivers two kegs to the chamber: saltpeter from Abigail and the women of Massachusetts. Dr. Hall returns to the Chamber. He has been thinking: “In trying to resolve my dilemma I remembered something I’d once read, ‘that a representative owes the People not only his industry, but his judgment, and he betrays them if he sacrifices it to their opinion.’ It was written by Edmund Burke, a member of the British Parliament.” He walks over to the tally board and changes Georgia’s vote from “nay” to “yea”. It is now July 2, 1776. The delegates slowly return to the chamber, including Caesar Rodney. Hancock calls for the vote on the Lee Resolution. Thomson calls on each delegation for its vote. Pennsylvania passes on the first call, but the rest of the northern and middle colonies (save New York, which with some self-disgust again abstains “courteously”) vote “yea”. When the vote reaches South Carolina, Rutledge demands the removal of the slavery clause as the condition of the “yea” votes from the Carolinas. Franklin pleads with Adams to remove the clause (“First things first, John … Independence. America. If we don’t secure that, what difference will the rest make?”) and Adams turns to Jefferson. Jefferson reluctantly crosses the chamber and scratches out the clause himself. Rutledge and the Carolinas vote “yea”, as does Georgia. Pennsylvania’s vote, which is the last vote needed to obtain the required unanimous approval, is called again, Dickinson declares that “Pennsylvania votes…”, only to be stopped by Franklin who asks Hancock to poll the members of the delegation individually. Franklin votes “yea” and Dickinson “nay”, leaving the swing vote to Wilson, who normally adheres to Dickinson. Seeing his hesitancy, Dickinson tries to entice him: “James, you’re keeping everybody waiting … the issue is clear.” Franklin remarks that “most issues are clear when someone else has to decide them”, and Adams mercilessly adds that “it would be a pity for a man [Wilson] who has handed down hundreds of wise decisions from the bench to be remembered for the one unwise decision he made in Congress.” Wilson doesn’t want to be remembered as “the man who prevented American independence” and votes “yea”. The motion is passed. Hancock suggests that no man be allowed to sit in Congress without affixing his signature to the Declaration. Dickinson announces that he cannot in good conscience sign such a document, and still hopes for reconciliation with England. However, he resolves to join the army to fight for and defend the new nation. Adams leads the Congress in a salute to Dickinson as he leaves the chamber. Hancock leads the delegates in signing the Declaration, but is interrupted by the courier with another dispatch from Washington, “Commander of the Army of the United Colonies … of the United States of America.” He reports that preparations for the Battle of New York are under way, but expresses concern about America’s badly outnumbered and under-trained troops. Washington’s note to Lewis Morris that his estates have been destroyed but that his family has been taken to safety emboldens Morris to state that he will sign the Declaration, despite the lack of instructions from the New York legislature, saying, “To Hell with New York. I’ll sign it anyway.” New York’s vote is moved into the “yea” column. On the evening of July 4, 1776, McNair rings the Liberty Bell in the background as Thomson calls each of the delegates to sign their names on the Declaration of Independence. The delegates freeze in position as the Liberty Bell rings to a fevered pitch. The musical toured for two years in the U.S. and was given a London production, opening on June 16, 1970 at the New Theatre. The production starred Lewis Fiander as Adams, Vivienne Ross as Abigail Adams, Ronald Radd, Bernard Lloyd, David Kernan as Rutledge, John Quentin as Jefferson and Cheryl Kennedy as Martha Jefferson. According to The Columbia Companion to American History on Film, historical “[i]naccuracies pervade 1776, though few are very troubling.” Because Congress was held in secrecy and there are no contemporary records on the debate over the Declaration of Independence, the authors of the play created the narrative based on later accounts and educated guesses, inventing scenes and dialogue as needed for storytelling purposes. Some of the dialogue was taken from words written, often years or even decades later, by the actual people involved, and rearranged for dramatic effect. The central departure from history is that the separation from Great Britain was accomplished in two steps: the actual vote for independence came on July 2 with the approval of Lee’s resolution of independence. The wording of the Declaration of Independence—the statement to the world as to the reasons necessitating the split—was then debated for three days before being approved on July 4. The vote for independence did not hinge on some passages being removed from the Declaration, as implied in the play, since Congress had already voted in favor of independence before debating the Declaration. For the sake of drama, the play’s authors combined the two events. In addition, some historians believe that the Declaration was not signed on July 4, as shown in 1776, but was instead signed on August 2, 1776. The authors of 1776 had the delegates sign the Declaration on July 4 for dramatic reasons. Many characters in 1776 differ from their historical counterparts. Central to the drama is the depiction of John Adams as “obnoxious and disliked”. According to biographer David McCullough, however, Adams was one of the most respected members of Congress in 1776. Adams’s often-quoted description of himself in Congress as “obnoxious, suspected, and unpopular” is from a letter written forty-six years later in 1822, after his unpopular presidency had likely colored his view of the past. According to McCullough, no delegate described Adams as obnoxious in 1776. Historian Garry Wills earlier made a similar argument, writing that “historians relay John Adams’s memories without sufficient skepticism”, and that it was Dickinson, not Adams, who was advocating an unpopular position in 1776. For practical and dramatic purposes, the play does not depict all of the more than 50 members of Congress who were present at the time. The John Adams of the play is, in part, a composite character, combining the real Adams with his cousin Samuel Adams, who was in Congress at the time but is not depicted in the play. Although the play depicts Caesar Rodney as an elderly man near death from skin cancer (which would eventually kill him), he was just 47 years old at the time and continued to be very active in the Revolution after signing the Declaration. He was not absent from the voting because of health; however, the play is accurate in having him arrive “in the nick of time”, having ridden eighty miles the night before (an event depicted on Delaware’s 1999 State Quarter). In the play, Richard Henry Lee announces that he is returning to Virginia to serve as governor. He was never governor; his cousin Henry Lee (who is anachronistically called “General ‘Lighthorse’ Harry Lee”, a rank and nickname earned later) did eventually become governor and would also become the father of Confederate general Robert E. Lee. John Adams was also depicted in the play and the film as disliking Richard Henry Lee. That is not the case as, according to David McCullough, Adams expressed nothing but “respect and admiration for the tall, masterly Virginian.” He did, however, contrary to what was portrayed in the play and the film, dislike Benjamin Franklin. Martha Jefferson never traveled to Philadelphia to be with her husband. In fact, she was extremely ill during the summer of 1776, having just endured a miscarriage. The play’s authors invented the scene “to show something of the young Jefferson’s life without destroying the unity of setting.” James Wilson was not the indecisive milquetoast depicted in the play. The real Wilson, who was not yet a judge in 1776, had been cautious about supporting independence at an earlier date, but he supported the resolution of independence when it came up for a vote. Pennsylvania’s deciding swing vote was actually cast by John Morton, who is not depicted in the musical. The quote attributed to Edmund Burke by Dr. Lyman Hall in a key scene with John Adams is a paraphrase of a real quote by Mr. Burke. The song “Cool Considerate Men” is anachronistic because the terms “right” and “left” in politics were not in use until the French Revolution of 1789. John Dickinson, who is portrayed as an antagonist here, was motivated mainly by his Quaker roots and his respect for the British Constitution, having lived in England for 3 years in the 1750s. He was no wealthier than some members of the pro-Independence faction, and freed his slaves in 1777. Thomas Jefferson wrote that “his name will be consecrated in history as one of the great worthies of the revolution”. The musical also deviates from history in its portrayal of attitudes about slavery. In 1776, after a dramatic debate over slavery, the southern delegates walk out in protest of the Declaration’s denunciation of the slave trade, and only support independence when that language is removed from the Declaration. The walkout is fictional, and apparently most delegates, northern and southern, supported the deletion of the clause. The musical claims that Edward Rutledge led the opposition to the supposedly anti-slavery clause in the original draft of the Declaration. This is false on two counts. 1) The clause did decry the slavery trade, but was particularly concerned with the fact that, following Lord Dunmore’s Proclamation, England was granting freedom to runaway slaves who joined the army, thereby calling out King George’s hypocrisy in attempting to free slaves, who he had previously been intent on keeping in chains, purely as an incitement against the rebelling Americans. So, while expressing an “anti-slavery” sentiment, the clause did also complain about the freeing of slaves, expressing an intellectual rift that would later snowball into the Civil War The 2) Rutledge’s leadership against the clause is completely fictional. According to Jefferson, the clause was opposed by South Carolina and Georgia, plus unspecified “northern brethren”; that is the limit of known information about opposition to the clause. Rutledge was a delegate from South Carolina, but there is not one item of evidence in the historical record that he played any part—much less that of leader—in the opposition to the clause. Thomas Jefferson is depicted as saying that he has resolved to free his slaves, something he did not do, except for a few slaves freed after his death 50 years later. Franklin claims that he is the founder of an abolitionist organization, but the real Franklin did not become an abolitionist until after the American Revolution, becoming president of the Pennsylvania Abolition Society in 1785. The phrase “We are about to brave the storm in a skiff made of paper”, placed in the mouth of John Hancock, was actually stated by John Dickinson (“Others strenuously assert…we ought to brave the Storm in a Skiff made of Paper.”) in his arguments against independence. In both the play and the film, John Adams sarcastically predicts that Benjamin Franklin will receive from posterity too great a share of credit for the Revolution. “Franklin smote the ground and out sprang—George Washington.. Fully grown, and on his horse. Franklin then electrified them with his magnificent lightning rod and the three of them—Franklin, Washington, and the horse—conducted the entire Revolution all by themselves.” Adams did make a similar comment about Franklin in April 1790, just after Franklin’s death, although the mention of the horse was a humorous twist added by the authors of the musical. A Director’s Cut of the original film has been released in DVD. Both the look and sound of the original film have been improved through modern technology. Many cuts to the original film by the producer Jack Warner have been restored, including a musical numbers. Musical underscoring has been removed from several scenes without songs in order to strengthen the focus on dialogue. Bonus material includes commentary by Director Peter Hunt and by Peter Stone, the book/screen writer. Among other topics, they discuss artistic liberties and anachronisms were used to dramatize the events.